All Forums >> [Artix Entertainment Games] >> [AdventureQuest] >> AdventureQuest General Discussion >> AQ Design Notes >> =AQ= December Guardian Bonus! 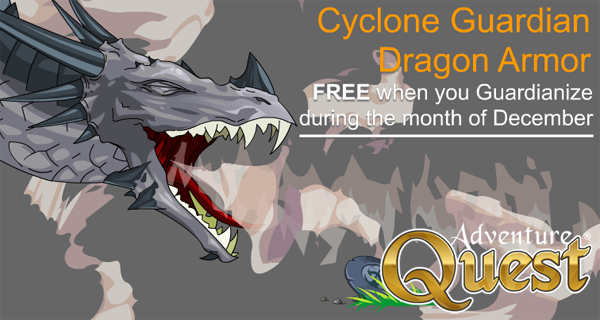 Coming in December you will be able transform into a mighty Cyclone Guardian Dragon! This awesome armor comes FREE when you Guardianize any time during the month of December. Existing Guardians can find the armor in the Guardian Tower at a super discounted price! Grab this armor while you can because it will only be available until the end of December and then gone forever!